If you belong to those kinds of traveller looking for something rather original instead of convenient, then these three beaches are for you. First of all you need to go to a part of the island that most influential writers call “The Other Elba”. This refers to an area of ​​the island not frequently visited by tourists and for this reason has retained its original character, however, this cliché just means swimming so, in a nutshell, you have to go to Rio Marina, a small mining town built around the port, and where for centuries countless tons of glossy black powder have amassed, which is an oxide iron called hematite from which the Etruscans already mined iron. Unless you are not interested in mines and minerals, you should stop in town and visit the local Mineral Museum, then visit to the old mines with a guide. Or you could take the scenic route of the “Marina”, called Via Baroccia. This is an unmade road, rather narrow and largely dusty which travels for a few kilometres along the coast and in the last section into a cool forest of oaks, here the road is lined with houses and apartments of all kinds, usually rented to foreign tourists. 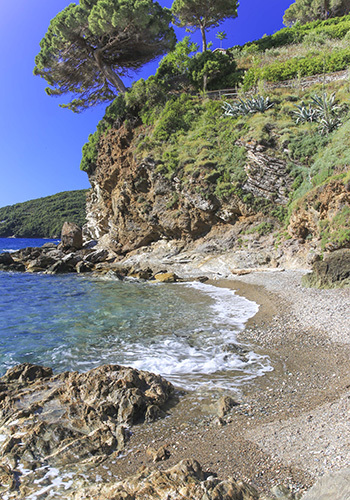 Gennaro Beach is the first you come to, a cove dominated by a high cliff made up of shale. This is the same rock where years ago they extracted wonderful quartz crystals and rare crystallization of Hedembergite. A few steps up a short steep path takes you to this quiet beach, which has room for only about five or six people.. On the right, the cliff rises steeply with many large blocks of rock collapsed into the sea, there is a lush pine overlooking the beach from its precarious position like a young and talented tightrope walker. Gennaro was the name of a pharmacist, the former owner of the surrounding land, now divided into many small plots, some of which are still cultivated, but generally they are used for summer homes for visitors. Also the neighbouring beach is named after the former owner: Luisi d’Angelo. It is very similar in size and has the same geological nature as Gennaro, but Luisi d’Angelo is located at the end of a long, narrow wooded lane and to reach it you take a steep trail in ilex, nearly impossible to find if there weren’t any signs. There is a second less steep path that belongs to a white manor house from the early twentieth century. This trail ends right on the beach with an iron gate. At the foot of the wall you will notice a big square block of white marble, and by looking carefully you will see a second one emerge. Both come from an old quarry which had been long forgotten, we do not know why they were abandoned, but the interesting thing is the complexity and variety of the rocks of this reef, where among many crystallization types, there is also the white marble, a material that few could afford on the island, so much so that it was used mainly in religious buildings. 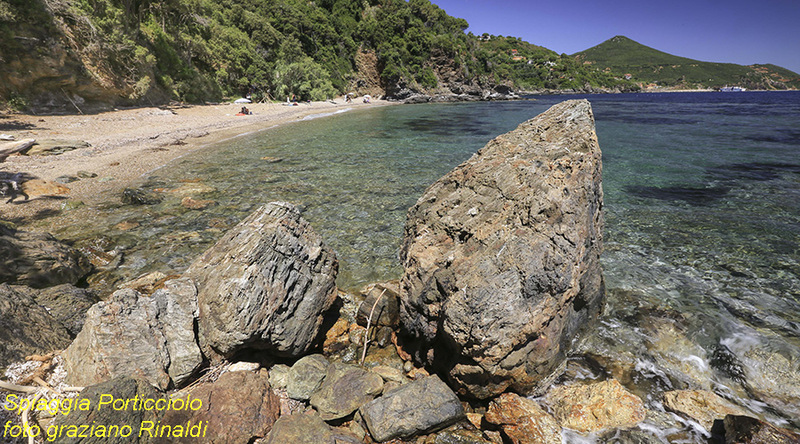 If you do visit these two small beaches, there won’t be time for the biggest and most popular called “Porticciolo”. It too is small, but at least three times larger than the other two and is located almost at the end of the road and, like the others, needs a good ten minutes walking in the woods. There is a characteristic “mushroom” of stone that rises from the sea in the northern part of the beach. Behind it a rocky sandy cove lies mostly in the shade, which is over shadowed by an amazing vertical cliff. 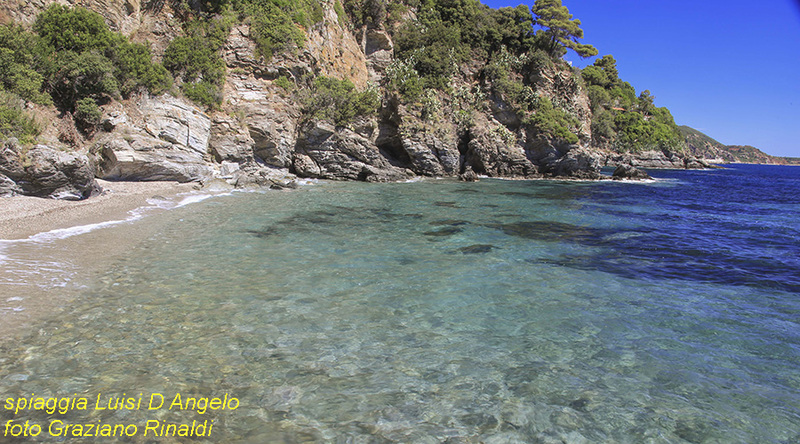 It’s great to swim in front of the beach of Porticciolo, where large spaces and clear sandy beaches alternate with large clumps of Posidonia, and the shallow waters are well populated with fish. All three beaches are located in a stretch of coastline of not more than one kilometre, characterized by a cliff shapes and beautiful colours that give the idea that you are dealing with something very ancient and tormented. The mainland coast of Tuscany is laid out in front of you and in the middle, clearly visible are the two islets of Cerboli and Palmaiola, behind the evergreen vegetation reaching down to where the waves are lapping, far away but still noticeable you can see the red soil of the old iron mines, a reminder of the origin and vocation of the eastern part of the island. From these three beaches you can see the sun rise, but at four in the afternoon it will be almost completely in shade. Nevertheless, in the late afternoon, on these beaches you can feel a special atmosphere, as if we were in a world of our own ,a far and primitive place that summarizes the strong and disturbing ancient cliffs and the happiness of the last light of day.